Time for a much needed pub round up. If you don't like beer, I would stop here. Maybe read a nice post on Polpetto or Bermondsey Street instead? Tuesday 10th December - Pelt Trader opened up round the corner from Cannon Street Station back in March and sat atop my craft beer bar wishlist for many months before I finally made it in December. With more than 16 exciting beers on tap at once, discerning City drinkers (they exist) finally have somewhere to go for a good pint. The range of beer is superb and well priced. We stuck to halves to get through the likes of Moor Raw, Weird Beard Hive Mind, Lagunitas IPA, Tiny Rebel Zool, and To Øl Frostbite from Denmark. There's normally a German lager, a cider, a wheat beer and a fruit beer of some kind to keep everyone happy (plus wine, spirits etc for kids). On the food front, there are Ray's enormous 18" pizzas and £4 Mountain Meat boards. Our second pub stop of the evening was Hack & Hop, just off Fleet Street near the wonderful City of London Distillery Bar. 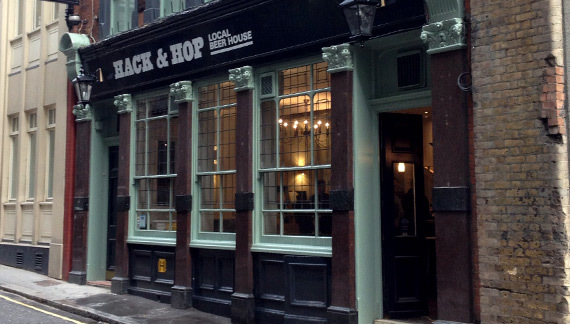 Hack & Hop is the third pub from Pubs of Distinction, following on from the excellent Old Red Cow near Barbican, and The Dean Swift near Tower Bridge. They all have great beer and above average pub food (Hot Cheese in a Box for two! ), but are slightly lacking in the warm & inviting pub décor department. No matter, anywhere with a beer board gets extra points from me. I occasionally get caught out by some outrageous prices (over £6 for a pint of Moor Nor'Hop in The Dean Swift once), but if I had bankers walking in and ordering blindly every day, I'd probably do the same. 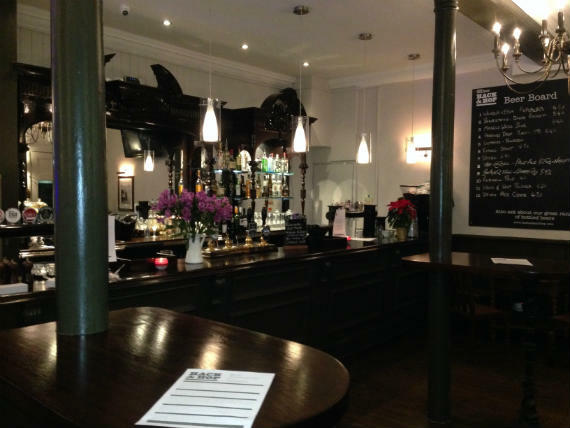 I am pleased to see more sites behaving like pubs rather than beer bars. Both Hack & Hop and The Dean Swift regularly show sport. The Draft House chain also deserve praise for this, even if it does get a bit hectic in them sometimes. Football & rugby fans like good beer too, you know. Monday 16th December - A cancelled game of 5-a-side left me without much to do on a Monday night. Instead of going for a run to make up for the lack of exercise, I decided to go to Craft Beer Co.'s latest pub near Clapham Common for a beer (or two) and a burger. Unlike Pubs of Distinction / Draft House, every Craft Beer Co. site has a different feel, and the Clapham branch (with its 30+ taps) has a much more traditional pub atmosphere than say their "beer bar" in Brixton. Personally, I love them both! Locals seem to know how lucky they are as it was incredibly busy for a Monday night. With 400+ bottles, and constantly rotating kegs, Craft are basically hosting a never ending beer festival, but they still find time to run tastings, tap takeovers, meet the brewer events and much more. If you are feeling adventurous, order one of Evil Twin's amusingly named bottles - do you want Even More Jesus, Monk Suffers Serious Sugar Rush on Barbados, or Justin Blåbær? Then there is the added bonus of Forty Burgers with their delicious burgers (try the Elvis - signature patty smothered in smooth peanut butter topped with crispy bacon and fried bananas!) and chips covered in "bacon dust" - bonkers. With top beer, carefully chosen spirits, tasty food, a beer garden, a great atmosphere and board games (Totopoly is a game about Toto, right? ), the Clapham Craft might just be my favourite branch yet. 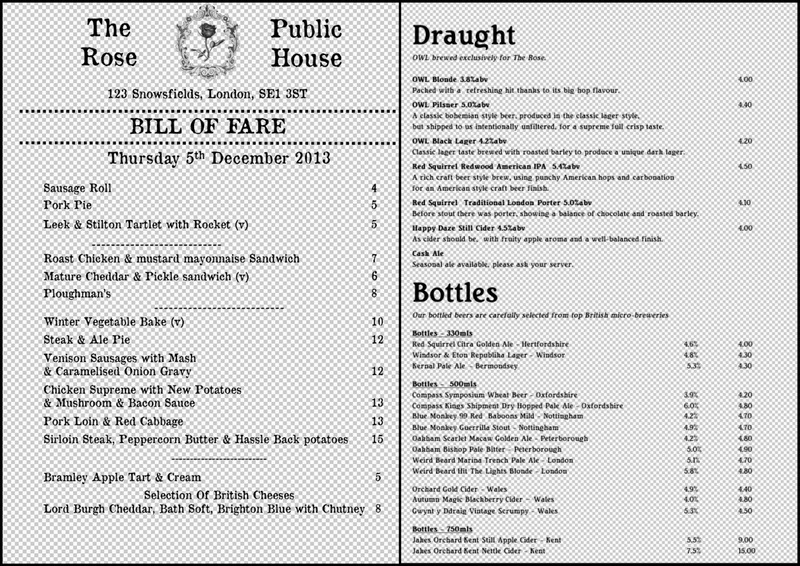 Tuesday 17th December - The Earl Derby opened on Kilburn High Road before Christmas. It's ever so slightly out of my way, but the orange line came to the rescue as usual. It's not trying to compete with the likes of Pelt Trader and Craft, but there were several interesting beers on tap including Innis & Gunn's Toasted Oak IPA and a Charles Wells & Dogfish Head collaboration called DNA. 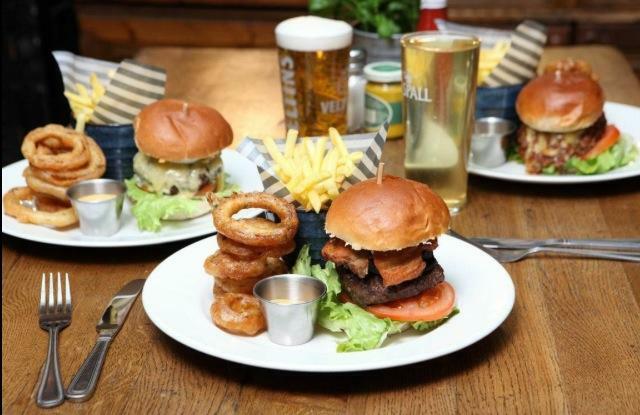 There are plenty of reasons to pop in with a daily changing food menu, Tuesday music quiz (8pm), Thursday beer & burger night, Sunday records and roasts, and board games & lego ready to go. The food was tempting but we couldn't resist popping round the corner to Spicy Basil, a Kilburn institution. Expect to queue to get in to this cheap and cheerful Thai joint. It's been decorated with items from poundland, portions are enormous and noone speaks any English - I can't recommend it highly enough. 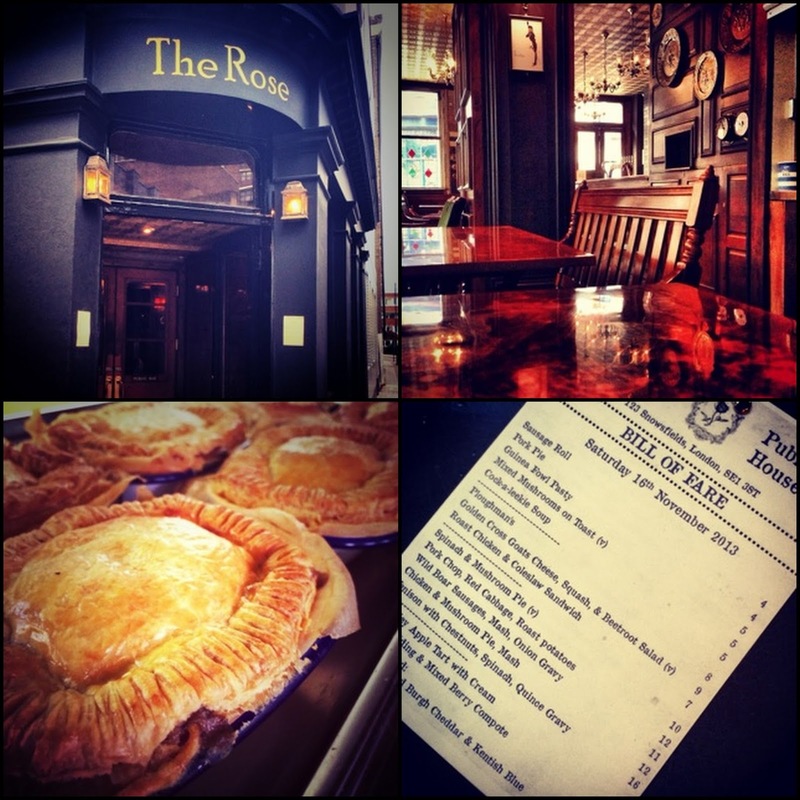 Last but not least is The Rose Public House, a hidden gem tucked away between Bermondsey Street and London Bridge, near The Miller. It used to be an absolute dive, but it has been royally refurbished. Pennies line the floor on the way to the toilets, barrel aged cocktails sit on the back bar, and the food menu prefers to be called a Bill of Fare. 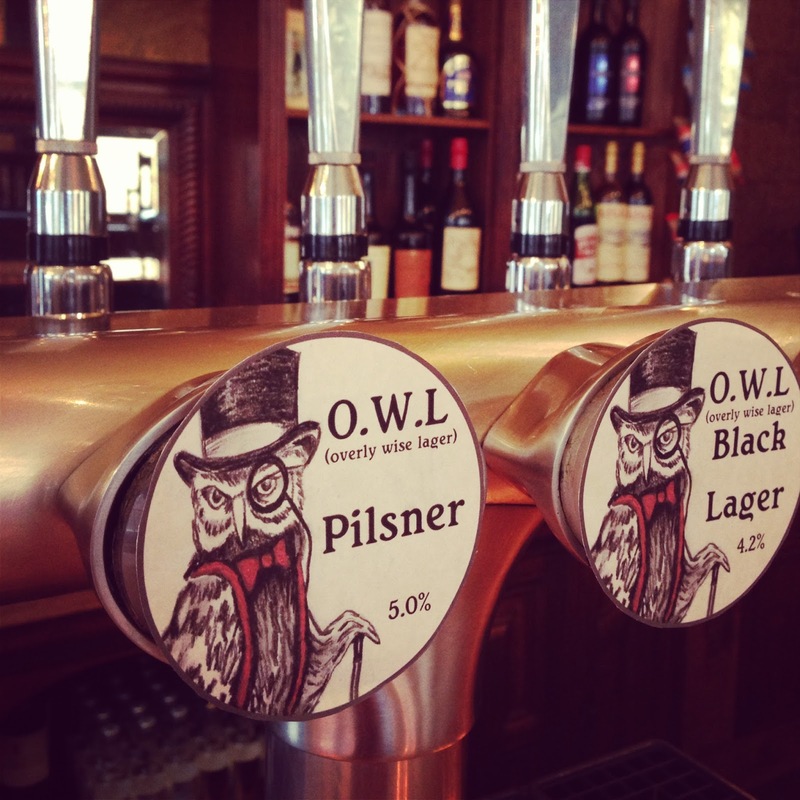 They have occasional guest beers on draught, but the regular Red Squirrel beers are fantastic (go for the Redwood American IPA) as are the OWL beers (Overly Wise Lager - brewed exclusively for The Rose by Red Squirrel). The bottled beer & cider list is short but sweet with interesting offerings from the likes of Weird Beard and Compass. The food isn't half bad either. Hopefully everyone has stopped reading already, and I can keep this pub all to myself! Thanks, Matthew! I just approved your blog claim. Now your Urbanspoon profile picture is displayed on your blog page. You can upload a blog-specific photo if you prefer, and can change a few other blog settings there. Also, if you vote for a restaurant that you've reviewed on your blog, we now show your vote next to your post everywhere on our site.